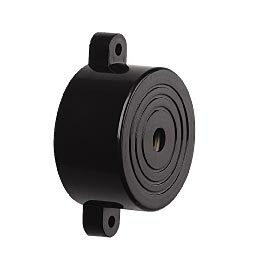 Here is a 3 component Heat sensor. You can attach it with the heat generating devices like CD player, Inverter etc. When the heat inside the cabinet of the device increases above the set limit, buzzer beeps. NTC (Negative Temperature Coefficient) Thermister is used to switch on/off the NPN transistor BC547. At room temperature, the NTC Thermister offers its maximum resistance which drops when the temperature in its vicinity increases. VR1 set the temperature level at which the alarm should sound. When the temperature is normal ( as set by VR1) Transistor is off and when the temperature increases, Thermister conducts and switch on the transistor. 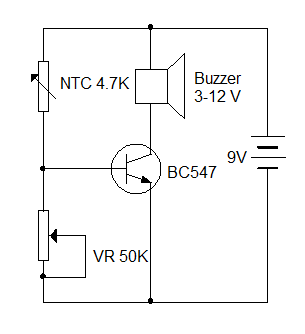 When this happens, buzzer beeps.5-12 volt DC can be obtained from the device itself.